Earlier this month, Alex Zanardi won the Italian Touring Car Championship at the wheel of a BMW. Even if you don't "get" auto racing, give me a chance to tell you why Zanardi is one of my personal heroes, and why he's an important role model for innovators. Simply put, Zanardi, has the kind of singular genius that makes something very difficult look oh so easy. He is an incredible driver, very talented. During the 1990's, from his come from behind win at Long Beach, to his audacious Corkscrew maneuver at Laguna Seca (in racing circles simple referred to as The Pass), Zanardi was the guy you knew would always go for it, would never ever - ever! - give up. In other word, Zanardi is a racer, a person intrinsically motivated to win. He almost died in 2001. 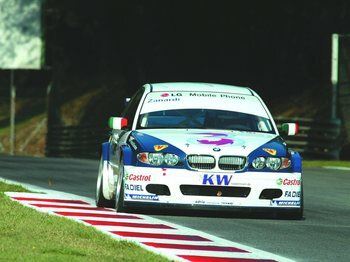 Zanardi's recent Touring car crown is all the more remarkable because it was achieved by a man whose legs were amputated above the knee, by a man whose died several times in a helicopter on the way to the ER room after his horrible accident. Made all the more remarkable by the fact that, after regaining his health, his intrinsic motivation led him to figure out a control system for his racing BMW which uses his hands and his hip so effectively that he could not just be competitive, but be the most competitive in what is a very competitive racing series. At the risk of trivializing Zanardi's accomplishments, let me say this: innovation is a difficult pastime. Most of the time it's not glamorous, fun videos about shopping carts not withstanding. You're going to lose a lot of the time. Ideas get beat up mercilessly. Hard work gets flushed down the toilet. People don't believe you can do it. And the real world has a way of providing harsh feedback on things that work very well in theory but not in practice. If you're serious about changing the world, innovation is ultimately about doing, and ultimately, winning. Winning, as it turns out, is tough. I think great innovators - winners - share a lot in common with great racers. I just want to be a great racer. That's why Zanardi is my hero. Diego, as you say - innovation is so so far beyond cute design or product features - a part of life itself, whatever one does. diego, until this post i always respected you. now i like you too. man, this is where your heart is. Resistance to change (innovation) is way too common. Innovation does not guarantee victory… lack of innovation certainly guarantees (slow) defeat. Congrat's to Zanardi, and your point is well reinforced by the comments to this blog. Innovation is difficult and I have found in the past that Dr. Giovanni Dosi has documented most of key components of this difficult topic in his research. Highly recommend it. I am currently reviewing his research on my blog, check it out, comments appreciated. I was very fortunate to have met Alex before his accident and I can attest that the man today is as great a man as he was after his first victory in CART. Having read his book and being able to see in print some of the stories that he told me years before was extremely gratifing. Alex is a man worthy of hero status and I will cherish my memories of him forever. I was also fortunate to have been assigned to flag the corner at Laguna for "The Pass" so I guess that Alex and I have some sort of destiny and I hope that our paths cross yet again in the future. Zanardi's book is EXCELLENT -- highly recommended!